I don't know about you, but I'm looking forward to getting away from the Nats and the Pirates. Gotta win those, but man those teams are lame. Tonight promises to be a real battle between a couple of the better pitchers in the NL. 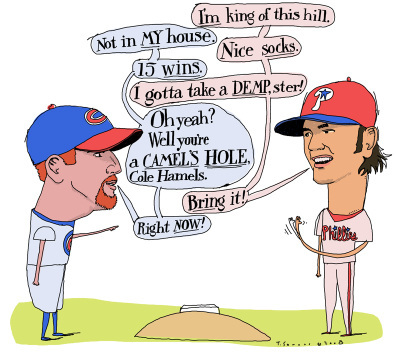 Cole Hamels is 11-8 with a 3.20 ERA, and remember he shut down the Cubs completely in April giving up only one hit over seven innings in a 7-1 Phillie smear. Our stud pup Ryan Dempster weighs in at 15-5 and 2.85, and I think you know he's been sort of good at home. So it should be a good one tonight. It was different fishing last night. I'm a little shy of getting too close to shore, and any noise makes me jerk my neck. And while I saw a small herd (4) of racoons, and a loon chased my lure, and a beaver came up behind me and splashed the water with his tail (I damn near jumped out of the boat)... I didn't see the bear. Also didn't see Mr. Musky, but I'm not done yet. Okay Cubs, it's a real team tonight just a half game out of first in the East, so lets please keep the W's happening.